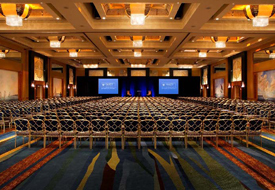 Organizing a conference can be a logistical nightmare. Picking a site, finding hotels, managing payments, inviting speakers, scheduling sessions (including those all-important coffee breaks)….and speaking of coffee breaks, do I need to buy coffee? Oh, and food. What about a banquet? How are the rooms going to be set up? Should I publish proceedings from the conference? Just typing that made me stressed out. If the conference is still months away and you’re already considering therapy, don’t worry, AstroBetter has your back. Or rather, the fantastic Facebook Astronomers community does. Several months ago, someone asked for tips on planning a conference. And the group response was overwhelming. From registration fees to having spare projectors on hand, here’s a summary of some of the most important tips. Delegate, delegate, delegate! This is easily the number one rule for all aspects of conference planning. Designate someone to answer emails and respond to problems with payments, roommates, etc. Assign someone else to help with the financial side. And don’t forget to reach out to students–it can be a great learning experience for them. Above all, if you try to do it all yourself, you will quickly become buried in logistics and minutiae rather than focusing your energy where it should: planning an amazing meeting for your participants. Check with your institution to see if they have an office that helps with conference organizing. They may already have a web-based system for collecting registration fees that you can link to your conference website. Double check on any fees you may have to pay to use this service. During the planning process, start an expense/income spreadsheet to capture everything you’ll be responsbile for paying and every source of income. This can help prevent unpleasant surprises down the road. Be sure to select a city/conference center/hotel that not only satisfies the needs for your meeting but is also easily accessible. Be strict with your registration deadlines. This will save you many headaches later on. Clearly state your cancellation policy for the registration fee and hotel. Make sure that attendants are aware of whether or not they need a visa and how to obtain it if necessary. Stick to a flat registration fee (e.g., I will not attend the sessions on Tuesday, do I still have to pay the full fee?). Doing so can be a logistical nightmare and will screw up your budget. Aim for a good gender balance in the invited and contributed talks (and the SOC as well). Try targeting younger researchers for the invited talks to both promote newer voices and reduce the number of talks given by senior scientists who give similar talks at multiple conferences every year. Have a few backup speakers in case there is a cancellation a few days before the conference. Provide invited speakers with guidelines to any points you would like them to address in the context of the meeting. Avoid talk fatigue! Don’t pack the conference schedule with long days and short talks. Aim for fewer longer talks that present substantive material without speed-talking. Allow plenty of time for breaks. Interacting with fellow attendees is many times the most important element of a conference. Aim for a 30 minute morning break, 30 minute afternoon break, and 90 minutes for lunch (shorter if it’s provided on-site). Set up coffee breaks by the posters. Remind your session chairs–and then remind them again–to keep speakers on time. If you think this will be an issue, pick senior researchers who don’t mind stepping on a toe or two to keep things humming along. Have a late start the morning after the conference dinner. Be sure to schedule talks and sessions so presentations are grouped in a natural way while avoiding too many similar talks in a row. Have backups for pretty much everything: projectors, microphones, laser pointers, batteries, etc. Print tickets for any special events and distribute them at registration to make logistics at said events a little easier. When printing nametags, don’t bother with the conference name and date (we all know what conference you’re at!) and use large font for the particpant’s surname. If you can, print on both sides since they almost always flip around. Check the location in advance to make sure you have enough room for your registration desk, general session, poster room, etc. Make sure the layout works, e.g., do you need chairs and tables, can everybody see the screen, do you need two screens. Check that there is reasonable access to electrical outlets. Don’t provide conference-themed coffee mugs / tote bags / backpacks. Most of them will be left in the trash can in the hotel room. Ensure your wireless setup has enough bandwidth–this can be the Number One Complaint. Have signs that show the locations of each room, including restrooms, registration booth, etc. Provide maps of the building and surrounding area. Every morning, before sessions start, have a few slides rolling automatically on the screen with useful information and program updates. Set up a cork bulletin board so participants can post messages to each other. Have assistants available to help speakers get setup. Don’t bother with conference proceedings–they’re a waste of time. Thank your LOC members at the end of the conference. This goes a long way. What have we missed? What lessons have you learned from conferences you’ve planned? If you’ve got an upcoming conference, what haven’t we answered? Let’s hear it in the comments! I strongly disagree with the conference proceedings being a waste of time, as some people will refuse to go to a meeting if there will be no proceedings published in a magazine (or if previouse instances of the conference haven’t published them in a timely manner). In my experience the conference-themed memorabilia is a nice touch of detail and I haven’t seen them wasted, but it is true that some things will end up in a closet never to be used after the conference (some bags for example, although useful to carry the notepad during the conference), so aiming for something more unique and useful could be a good idea (laser pointer, usb drive, etc). And as for the wifi… it would be great if some people could give some pointers on how to test them, because bandwidth is not the main issue but the ammount of devices accessing the APs, and how do you test that without bringing in a couple hundred laptops/smartphones/tablets to the place to test it?. Even more when the conference venue is the one providing the wifi. I have yet to meet anyone who likes conference proceedings. To those writing them, they are a burden, and those who come across them in the literature are excited by the title only to bring it up and say “#$*(&# it’s just a conference proceeding!” I think the role of conference proceedings, i.e. to let people know what you’re working on, has been superseded by having the presentations (in PDF form and/or actual video) available on the conference website. – and google for the reports from Chaos Communication Club’s networking people regarding their setups for Chaos Communication Congress and Camp, respectively (can’t find them right now). Oh, and provide a corner with sofas and Ethernet cables! if you support any phd students to attend by paying their registration, for example, ask them to help out at the conference. “Have assistants available to help speakers get setup” is a great option! recognize and thank your LOC members at the **beginning** of the conference! i found it helpful to have an admin member of our staff on the LOC. we were also able to invite her to the conference (which was in an exotic location), where she helped out with the rego table and was able to do necessary tasks while the rest of us were attending talks. I would add that as a rule, the SOC should not be nominating its members to give the invited talks, unless there is a compelling reason to do so. Way too often there is are too many SOC members giving invited talks. In fact, many times the *only* thing some SOC members do is nominate themselves (or their students). It is very important to have people on the SOC who will ethical in their work for the conference in finding good speakers. In addition to gender balance, you must be sensitive to representation among universities, observatories, and countries. For some reason, Canadians are not well represented at US conferences even as they have some of the experts in particular fields. Having lived in South America for most of my career, it was very apparent that in US conferences, if you are not in the US, you will tend not to be invited. At one conference where I was in the LOC we had quite a useful idea: the “local” conference attendees (including many students) all had a red name badge, and we announced at the beginning of the conference that for any questions on e.g. public transport, nice restaurants, nearest ATM, taxi numbers etc. people could ask anyone with a red name badge. Worked really well. When I’ve helped run conferences, we set up a countdown timer for each talk. Basically we used an old laptop with a countdown timer, counting down in minutes. We used LibreOffice (Powerpoint can’t time slides accurately – try it!) with a number on each slide and a 1 min progression between slides. You can add a sound for a 5 min warning and a big bong noise at the end. You can also add a 2nd monitor so the chair can see the countdown. Use a remote presenter/keyboard to start and stop the timer. It really kept people to time, even the more senior ones. People can’t object to being told to stop by a machine and the noise lets the audience know it’s the end. Maybe I can upload an example presentation if anyone would like it. Last time I was chairing a session, I used my ipad with the Timer+ app, set it up where the speaker could see, and found that worked well. Here are the timer presentations. The powerpoint ones can be off by a minute or two on the longer presentations, at least on Windows. I’d say it’s worth having someone specifically delegated to check on accessibility. Your institution is likely to have a person or office who can help with thinking of details to check here, eg. are there ramps to the stage? How long does it take people who can’t use stairs to get between rooms if there’s simultaneous speaker streams, or from rooms to teabreak areas, and are these routes marked on the conference map? I totally agree. The best conferences I have been, and the one I remember the most, are the ones where the discussions time overruns, but the chair has been clever enough to realise that it was an important discussion and let it happen. I understand that we need some sort of time-line, but aren’t we all going to the conference to really listen to what people have to say and appreciate or question it?. I completely agree! The whole atmosphere improves significantly if the participants are given some leg room for exchange at the end of the talks and during coffee breaks. No one will complain if a session ends 5 minutes ahead of schedule. To achieve this, however, the SOC has to abstain from handing out talk slots as if they were confetti just to avoid “stepping on someone’s toes”. One other aspect that comes to mind: In my opinion, 10+5 minute talks are horrible (for the speakers). You come up to the stage, state your name+affiliation+advisors/collaborators, show an introductory slide, some results and are off the stage again before the general audience (that is, everyone except for those working in your sub-field) has had the opportunity to catch on to your novel ideas. One notable exception to this is, of course, if the speaker has prior knowledge of the *details* covered in the review talk at the beginning of the respective session. If you have some extra funds, please consider subsidizing a few participants from developing countries. Often I hear folks discussing the need to overcome gender and background imbalance. However, very few raise the issue that astronomers in poor countries are under more challenging conditions than most, and often have less access to funds and opportunities. Also, if you wish to diversify your meeting, don’t be afraid to invite speakers from tier-two institutions (developing-world included) and a couple of postdocs. If the invited speakers are great (even if they’re not at a top institution, or very established), rest assured that those big shots who are genuinely interested in your meeting will follow. Plus, you can always promote the latter to become invited speakers if the SOC finds this suitable. Having healthy food options readily available at all provided meals/breaks is much appreciated and in the conference’s self-interest, as people are more likely to be alert and make better contributions to discussions if they’re neither hungry nor in a donut-and-cookie-induced stupor. Maybe I’m unusual in actually using conference swag, even backpacks. But I’d gladly forgo it if it meant registration fees wouldn’t be quite as absurdly high as they often are. Amen to the suggestion of setting up the venue so that people naturally end up chatting over posters. It is frustrating to spend a substantial portion of my budget on attending a meeting only to have a large part of the science content be marginalised. The nametag advice is so unbelievably obvious in hindsight, I can’t believe it didn’t occur to me. (This is probably the hallmark of it being a genius idea). I’ve also used a countdown timer when helping run meetings, and it works really well. We set up a small monitor at the back of the room, where it was clearly visible to the speaker, and controlled it from a laptop. When the time was up, the screen blinked to let the speakers know they should wrap up, which is less obtrusive than playing an annoying sound. It really does help to keep people in time, the psychological effect of watching a counter reach zero is surprisingly powerful. Having a visible timer also prevents those awkward situations in which the session chairs have to wave, jump and contort themselves to that the speakers can notice them. I agree about the uselessness of conference proceedings. Unlike other disciplines where you submit an actual paper to a conference, in astronomy most proceedings are either an abridged version of an already published paper or a preliminary description of an upcoming one. As a result, proceedings don’t tend to get many citations, save for exceptional cases such as reviews, lectures in summer schools, etc.